A woman who was killed when a caravan she was staying in was blown from a cliff in Co Galway this morning was a tourist who was enjoying a holiday in the area, it has emerged. There has been shock following the death of Swiss citizen Elvira Ferraii, who was aged in her 50s. 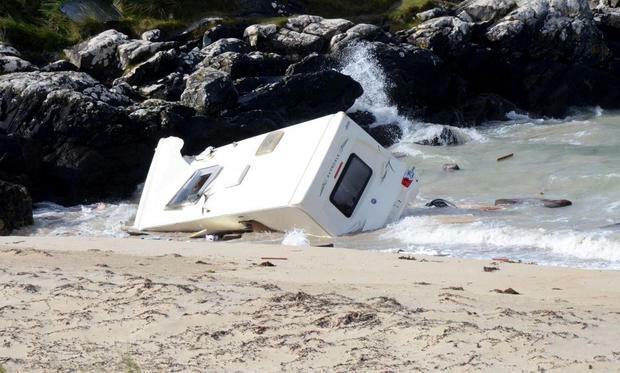 The holidaymaker was staying at the Clifden Eco Beach Camping and Caravan Park in Galway when a severe gust took her caravan over the side and down onto a beach. A source from the Embassy of Switzerland said it is aware of the tragic incident and confirmed that Swiss authorities have notified the woman's family of her death. Gardai and emergency services attended the scene at Claddaghduff, Co Galway at around 7.45am. It is understood the woman was sleeping in the caravan when it was blown from the cliff due to severely strong gusts. She was the only person in the caravan at the time. A search was carried out on Acton Beach and the woman's body was recovered, a garda spokesman said. Her body has been removed to University Hospital Galway for a post mortem and the local coroner has been notified. Sinn Féin counillor Tom Healy said the incident is an awful tragedy for the area. "It only happened a few miles away from me, it's a very unfortunate situation. "There are trees fallen all around Galway. We weren't expecting it to be this bad." President Michael D Higgins expressed his condolences to the woman and her family. "I am deeply saddened to learn that Storm Ali has already claimed one victim today. "I would take this opportunity to pay tribute to all those in statutory and voluntary organisations around the country, who are helping and stand ready to assist their fellow citizens, and who are working to maintain essential services around the country". Just hours later a man, aged in his 20s, also died in a storm-related tragedy and another was injured when a tree fell on them as they worked in a country park in Northern Ireland during Storm Ali. It is understood the men were doing contract work for Northern Ireland Water when the incident happened in Slieve Gullion Park, near Newry, Co Down, this afternoon. The man who died was aged in his 20s. The injured man, who is aged in his 40s, had been taken to hospital. A spokeswoman for the Police Service of Northern Ireland (PSNI) said: "Police attended the sudden death of a man, aged in his 20s, in the Slieve Gullion Park, Drumintee Road area of Newry this afternoon." Police said there were no suspicious circumstances and the incident was being investigated by the region's Health and Safety Executive. The Cliffs of Moher have been closed to all visitors until 1pm today. "Please do not visit the site as conditions are unsafe," the official website says. Forecasters warned yesterday and earlier this morning that Storm Ali is set to bring "severe and possibly damaging gusts of up to 130km/h" to some areas of the country. 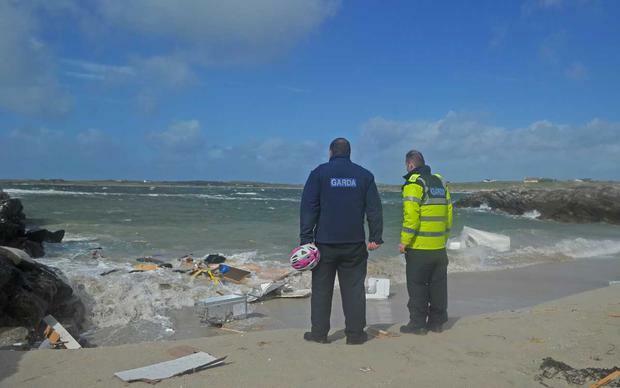 They advised "extreme caution" in the coastal areas of Clare, Connacht and Donegal. Forecasters have now confirmed that "the worst of the storm has passed". The Status Orange warning has now expired, while the Status Yellow warning will remain in place nationwide until later today. Meanwhile, motorists are still being urged to take care as fallen trees are being reported in Mayo, Longford, Galway, Kerry and Cork. Gardai are advising motorists in Claremorris, Co Mayo "not to travel" due to a large number of fallen trees. "Road conditions are dangerous across the country," AA Roadwatch said.